﻿Hello guys, like i always say, i will always try my possible best to update you guys free and affordable data plans as far as this blog Entclass.com lives. Here's another one from Mtn. Unlimited browsing, streaming and downloading with just N100 or N150, whichever one you like. But the downside of this is that, it selects Sims. i.e Not everyone here will be eligible for the offer. 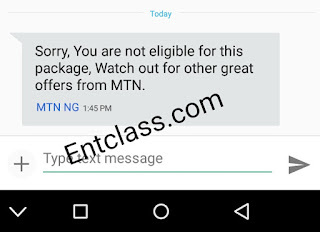 Before you load any airtime, kindly confirm if your Mtn Sim is Eligible for the offer. that means, you aint qualified for the offer. I'm sorry for that. But if you recieve a text that says, you don't have sufficient balance. That means you are eligible. Then you can go ahead to load a recharge card. HOW CAN I SUBSCRIBE FOR THIS PLAN? 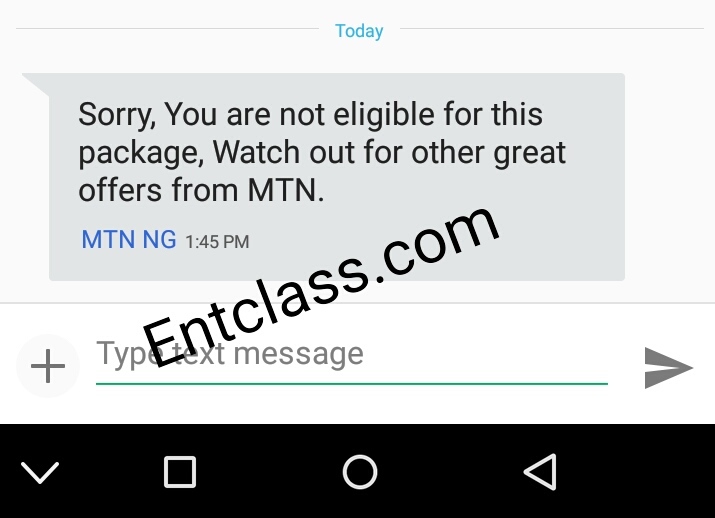 You will get a reply that says, you subscribed for the 100mb unlimited plan. Just ignore it. It is unlimited, start browsing, downloading and streaming. WHAT KIND OF PHONES ARE SUPPORTED? NO, you dont need any vpn app inorder to make it power all apps. Once you are eligible, on your Data and start surfing. CAN I HOTSPOT MY DATA TO ANOTHER DEVICE? YES, you can share your network/data to another device and also to your pc. Are you among of those that are eligible? Kindly let us know via the comment box below and dont forget to share this post using the share button below. That's the downside there. Really sad though.